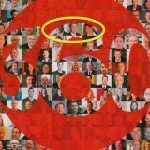 This post is by Richard Woodford who is the founding partner of CWA-Marketing and a member of the Marketing FIRST Forum. Richard has 15 years experience in marketing and marketing procurement for companies including Cadbury Schweppes, Merck, News International and was Chairman of the ISBA COMPAG Group for 7 years. Well my friends, colleagues and future employers I am here to tell you otherwise. 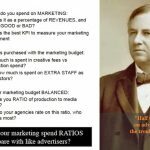 Marketing is a rich opportunity for those who are prepared to understand where the opportunities are and are able to manage upwards the requirements of the unconverted. In my opinion this is how Marketing needs to be segmented before the savings opportunities are identified and reported to any business. It may indeed seem common sense, but you’ll be surprised at how many companies do not adopt them prior to committing to almost unachievable savings targets. So I intend to give you a few terms that will allow you to make sense of a very complicated category and hopefully land you some savings numbers that will make you all famous. This is often the amount of money that is spent by the department so you could think of it as the gross spend covering all elements except resource. The spend levels of an average sized company are often double digit percentages of the total organisation’s turnover so you can imagine the scale. So a £1billion turnover company will often spend in excess of £100million on marketing. So for comparison if you start with your £100M spend then that will make the maths easy for later. If you continue to assume the 5% saving from earlier, this would mean that a committed potential savings of £5M. In the eyes of many a Procurement professional this would appear completely achievable given the size of the start point. This is often a big chunk of the overall category spend that is off limits and by off limits I mean that they are pass through costs. 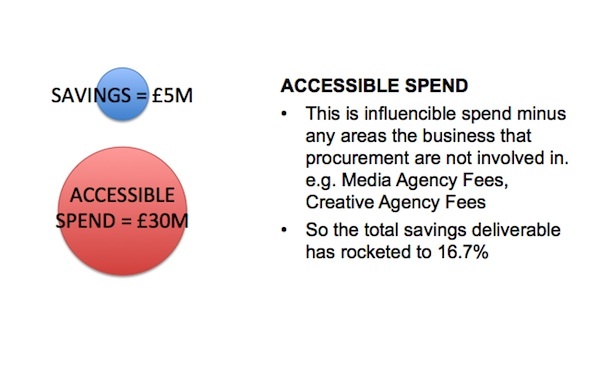 For example Media, Talent or Usage Rights are described as beyond the influence of Procurement – that said we can often broker direct media deals, but this will be small fry and very complex. If all this is added up it comes to quite a sizable sum. So if we go back to our original £100M and remove say 40% this takes the overall amount down to £60M and £5M in savings jumps from a 5% saving to 8.6%. 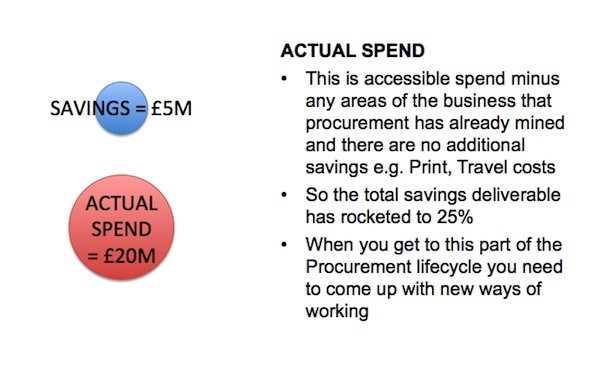 So once the spend that Procurement cannot influence has been removed we turn our attention to spend that is very difficult to get access to. It can take time to build relationships and earn the trust of stakeholders before they let Procurement loose on these higher risk more strategic categories. In this block of spend I would include Creative Agency Fees, Media Agency Fees, big elements of Digital and Mobile, Licensing costs for Promotional Items or Sponsorship for example. Also the opportunity to deliver savings early on is very difficult and it is easy to look at simpler parts of the category where you can look good and not cause too much damage. This also allows you to build trust and earn your spurs. 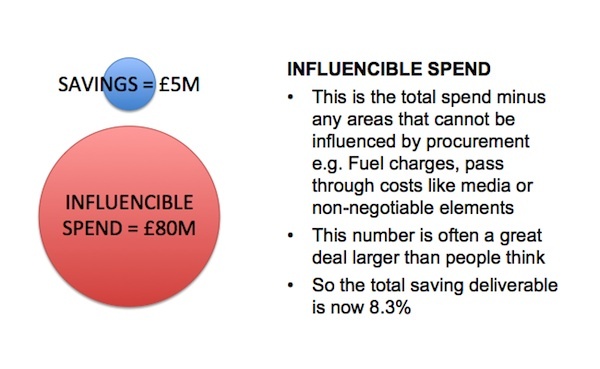 However, some of these can be big ticket items and can remove even more of the category spend so let’s reduce to £30 M or 30% of the original departmental spend. 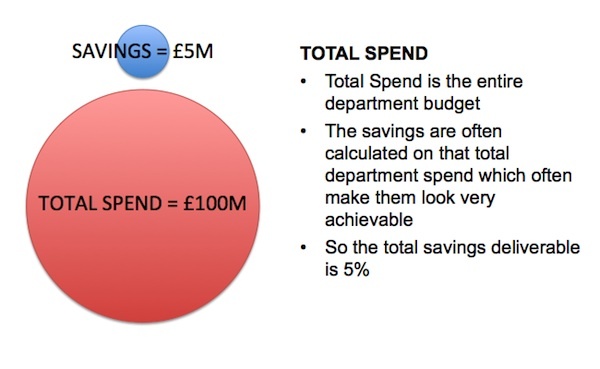 The original agreed savings target is still in place, but we now have to deliver 16% savings against spend. Some people would probably be getting ‘a little nervous’ at this stage. However, let’s look deeper. So you have been in place for sometime (a couple of years) and you have delivered most of the value and you are now looking around for further opportunities. So you’ve done Print, negotiated the Media Fees, tendered anything that moves, e-Auctioned your own grandmother and what are you left with? I would guess the spend could be a shadow of its former self at around £20 M and you are still nailed to the mast of the £5 M savings boat. This now represents a whopping 25% of the Actual Spend available. 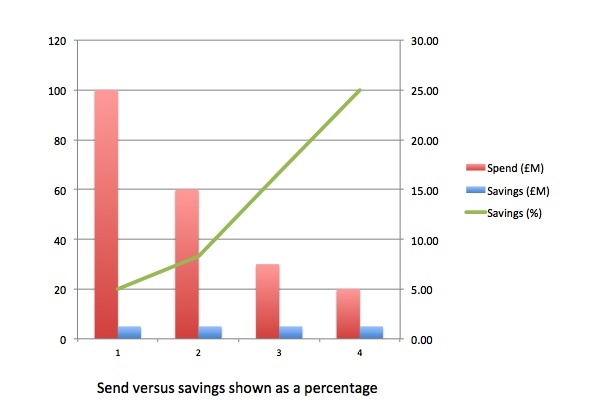 Now this example is a little extreme, but it is useful to show you how the total spend can easily decrease and that setting a savings target against the total category spend can be very dangerous indeed. 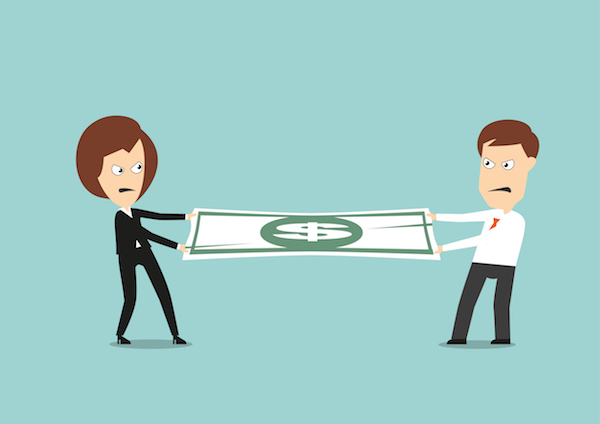 The right level of spend analysis and discussion with your stakeholders will ensure that you can follow through what is actually available for you to negotiate. The graphical representation below highlights the decline even more sharply and shows how steeply the savings line increases against the spend. If you follow the 5 – 7 Step Sourcing Process this is one of the vital elements to undertake before you commit to something that you cannot deliver. It is also vital to ensure that your Procurement Management and Finance Partners understand this, if they do then they will be valuable allies when you wish to swim further upstream. This analysis will also add a great deal of credibility to you as an individual and will enhance your reputation for the battles ahead. So it is time for us to really look hard at finding another way of adding value.